December 6th – 12th. Valid for travel from August 26th – December 23rd and January 5th, 2013 – March 31st, 2013 for Monday through Thursday departures. Use ITA Software Matrix Airfare Search and flexible month search to see availability. Must purchase by July 25th. 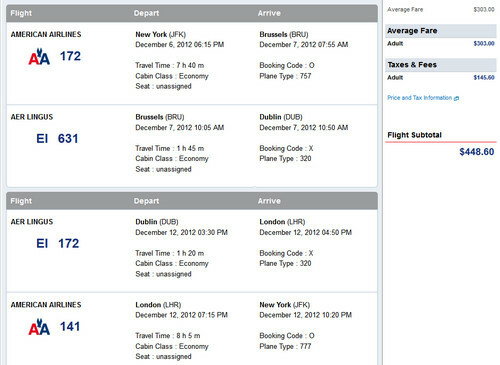 JFK – BRU (Brussels) – DUB (Dublin) – LHR (London) – JFK. The BRU-DUB-LHR portions are operated by Aer Lingus, the national carrier of Ireland and will not earn any miles with American Airlines.